I over-pack. Every single time I swear, “This trip I’m only going to take what I know I will need, not take anything extra, travel light.” And yet every time, my suitcase is heavier than I expect, jammed with things I will never use or wear. A four-day trip? I bring 8 pairs of underwear… just in case. A trip to the beach? Gotta bring a few pairs of socks in case my feet get cold, even though I plan to live in flip flops the whole trip. A quick overnighter? Can’t decide on the best outfit, so I bring nine. I make things so much harder on myself by toting around a big suitcase full of unnecessary stuff. It’s comical and yet, it’s also a metaphor for life. Everyone has “stuff” or emotional baggage. It’s the jumble of negative and unprocessed emotions that we have jammed deep inside ourselves– like an invisible mental weight. 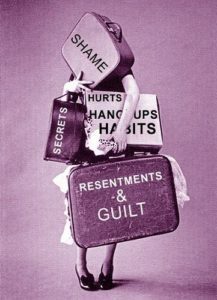 Emotional baggage is the sum of all the negative experiences we’ve held on to, and it weighs us down. Trauma, stress, guilt, fear, abuse, grief, abandonment, sadness, anger, or betrayal can magically be packed into an emotional suitcase that we close, lock up tightly, to avoid the pain of dealing with the hurt that has accompanied those negative experiences. People can carry so many unresolved issues that they are physically weighed down by emotions, often struggling with migraines, upset stomachs and neck or back pain. Our bodies can carry this extra weight, literally. Emotional weight is the weight of the thoughts, words, actions, beliefs, and experiences you have had that you carry on you just as you carry your physical weight. What would your excess pounds say if they could speak? Useless or bottled emotions can make us feel battered down, held back, struggling to find joy because of the inability to let go of the wounds we have experienced in our past. It literally slows down our journey. As we travel through life, the baggage can morph or change depending on what we continue to acquire, let fester, or build up. Some people can let go of all that doesn’t serve them and travel their journey unburdened with painful emotions or experiences. Others struggle daily, continuing to fill, stuff, cram, stow, load, or squeeze more unwanted stuff into their emotional luggage. What starts out as a backpack can quickly turn into something bigger–negative emotions spilling out all over the place and finding its way into all the relationships in your life. It can be sticky, dirty, and messy. Unwanted emotional trash is no fun to deal with. It can slowly trickle in and affect all areas of your life. It grows and it will consume you. Think about when your suitcase doesn’t close? Do you sit on it, jump on it, push everything down as hard as you can, hoping to get that zipper all the way around? Do you shove stuff into every pocket, and fill the space with items and stuff we will never use? What if you were to pack your suitcase with positive experiences and thoughts that offered ourselves compassion and kindness? What if you reevaluated and took some stuff out because all it did was make things heavier? What if you filled your suitcase with experiences that create value in our lives, not just things that clutter everything up? 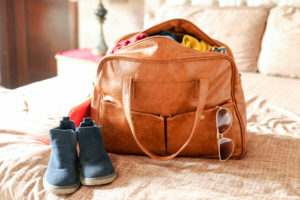 When we stop to examine what we are lugging around (exhale), we are often surprised by the weight and volume of “stuff” we have acquired along the way. Where did it all come from? People have wronged us, spouses have disappointed us, family have upset us, bosses have devalued us, parents have left us, ex-boyfriends have hurt us, friends have let us down. Instead of unloading the backpack to lighten our load, we often just move on to the next larger size, so we can add to all the muck and mess. We go from a backpack to a duffle bag to a suitcase, to a large trunk, and eventually to a dump truck. Emotional wounds multiply the longer we put off dealing with them. Pulling around a dump truck full of painful emotions is exhausting and yet, some people do it every day, never realizing that the more stuff we stuff, the harder life is. What does unpacking look like? It can be scary because lightening the load somehow makes us feel vulnerable, even though it is liberating and cathartic. Unpacking looks like carrying only what you need and eliminating all the things you will not use on your journey. It means changing your unhealthy habits if they are rooted in deep hurt or fear. Unpacking is learning to let go of past regrets and finding a healthy support system that lets allows to practice patience and forgiveness with ourselves. It means having acceptance of our imperfections and acceptance of others for not being perfect as well. Emotional unloading means we recognize that the past is the past and we move forward without bringing all the hurt and anger with us. It means realizing that forgiveness can’t change the past but it sure can change the future. The key to handling emotional baggage is to be aware of it, know it, own it, and handle it. Mindful living, we call it. Carrying of lifetime of heaviness, anger and pain is debilitating and puts a hazy lens on our journey through life. Don’t be a weary traveler missing moments because you’re exhausted from the weight of your baggage. Make space and leave room for the good that is to come. Eyes forward. Focus on what is ahead and be open to truly letting go. Bless your past, wish it well, forgive and let it go. Pack lightly. Travel well. Physical manifestations of carrying around emotional baggage – neck pain, migraines, stomach aches – it does make a person pause and reflect. Thank you for thought provoking article. I had the same thought as Julie! It’s interesting how emotional pain can manifest into physical pain.